There are a lot of dark family secrets in "Jessabelle," involving drawers of forgotten objects, Voodoo ceremonies in the woods, and VHS tapes containing ominous messages from beyond the grave. Steeped in Southern Gothic melodrama, "Jessabelle" is interesting in some of the small details, and in its strong sense of the Louisiana bayou atmosphere, and then it completely falls apart when it starts being a horror film. The trauma in the family story is full of potential, having to do with identity and how Jessabelle understands her own life, but all of that is short-changed for cheap scares that just are not scary enough and a preposterous plot that won't withstand the most cursory examination. Director Kevin Greutert, after directing multiple entries in the "Saw" franchise, feels adrift in tamer material. He responds to the Flannery O'Connor-esque qualities of the script (written by Robert Ben Garant), and there are details there that ring really true, but then he falls back on a lot of tired tropes from other horror films, missing the mark almost every step of the way. In the opening scene, Jessabelle (Sarah Snook) is about to move in with her boyfriend: she's pregnant and they are both excited. On their way to the new place, they get into a car accident. He dies, she loses the baby, and her legs are crushed. Wheelchair-bound now, she moves home to live with her gloomy father (David Andrews). Jessabelle's mother died when Jessabelle was a baby; she and her father barely speak to one another when she returns home. Expressionless, he leads her through the house to the dead mother's old bedroom, untouched since her death. Jessabelle will sleep there since it's on the ground floor. The house is the scariest element of the film; it is a masterpiece of a set (Jade Healy was production designer). Red brick on the outside, with tiny squinting windows, it is yawningly empty on the inside, rooms careening off into the distance, unfurnished except for random gigantic cupboards and cabinets shoved up against the walls. It feels like a place where time has stopped. Seen mainly from Jessabelle's point of view, rolling through it in her wheelchair, the house is disorienting. You never get the real lay of the land. You never see the upstairs. In a fit of fury, Jessabelle's dad throws out the video tapes and also tosses her wheelchair into the lake. Things go south from there. Jessabelle finds an unlikely ally in a high school boyfriend named Preston (Mark Webber), who is married and yet seems to have a ton of free time to drive Jessabelle around as she investigates her past. Their journey leads them deep into the bayou, and involves Voodoo altars, strange graveyards, and an old white-haired woman with giant terrified eyes moaning a Creole chant. Some of this ends up having undeniable racist implications, the black characters presented as completely "Other," with no humanity whatsoever, just frightening creatures with strange rituals emanating hostility and evil. The scenes where Jessabelle watches her mother on video tape are the best in the film. In them, there is emotional communication flowing between the past and the present, longings and needs on both sides, giving a unique look at the mother-daughter bond: the mother needs to tell her story, and maybe warn her daughter about something, and the daughter needs to feel close to the mother she never knew. The fact that Jessabelle starts out by losing her own baby is never mentioned; it's a huge dropped ball (one of many in the script). The main dropped ball in the film has to do with Jessabelle's injured legs. She cannot move without assistance, and is completely at the mercy of whatever horrible thing comes at her. 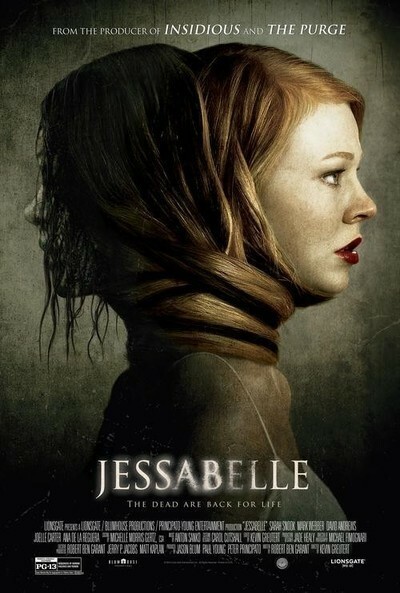 But "Jessabelle" totally lacks a visceral sense of how vulnerable she is; how trapped she is, physically. One needs only to think of the bone-chilling scenes in "Wait Until Dark," where blind Audrey Hepburn walks through her apartment, unaware that three thugs loom all around her in the shadows. As capable as she is as a character, she cannot see what we in the audience can see. Our helplessness is activated ferociously by her predicament, filling "Wait Until Dark" with a sense of pure dread. It seems a no-brainer that "Jessabelle", with its heroine in a wheelchair, should work on that same level, but it doesn't. Like so much else in the film, her physical disability just sits there onscreen, but unexamined beyond a facile surface level. Sarah Snook is good in the title role, especially in the solo scenes where she watches her mother's video-taped messages. There's a ton of bad vibes from her grumpy silent Daddy, there's a lot of mystery in who her beautiful mother really was, the secrets she hid. At one point, Jessabelle finds a couple of steamy romance novels her mother hid in a drawer, and Jessabelle says, delighted, and almost embarrassed, "Oh my word. Thank you, Mama." These are the true Southern-fried guts of "Jessabelle." These moments are specific and lived-in. If only it hadn't decided to be a horror film instead.